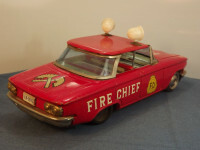 This model is the Ichico Corvair 4 Door Sedan Car in Red Fire Chief livery. 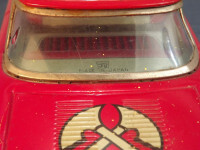 The item is tinplate, with friction drive and rotating roof lights. The model has a twelve-piece, pressed metal body, 235mm in length. It has been shaped with representations of the body lines, body panels and body trim. 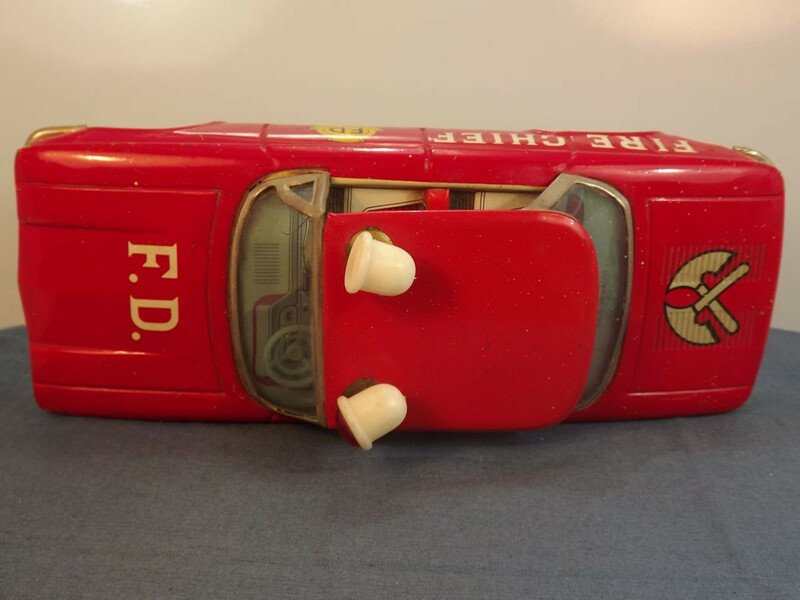 There is glazing at the front and rear - all other features are lithographed onto the body and interior. At the front is a separate chromed bumper with black on white numberplate [IK-0973], two twin headlight units (again in chromed metal), and the Corvair badge (chromed metal). The "bonnet" is a pressed shape and carries white lettering "F.D.". To the sides there are outlines of the doors without door handles, outlines of the wheel arch trim, and the body trim. The front side doors have been lithographed with yellow and black "F.D." 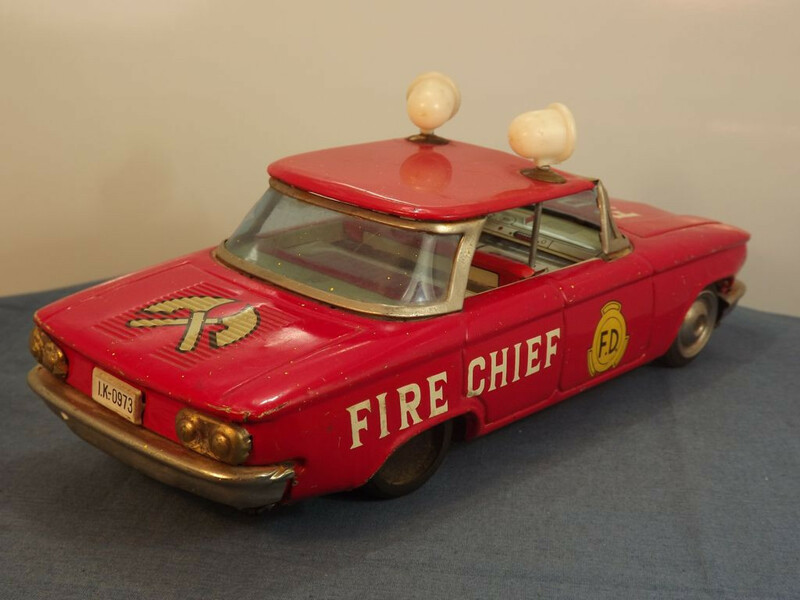 shields and the rear doors have white lettering "Fire" with the rear side panels carrying the word "Chief". The roof is red with a pair of White and Red roof lights in plastic that swing from side to side and the vehicle is pushed along. 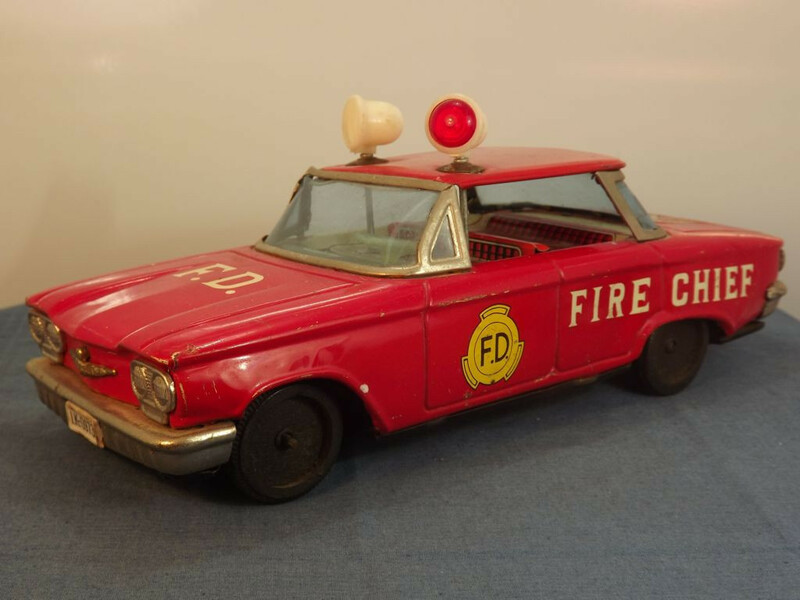 The rear "boot" outline and air vents are pressed into main body (the Corvair was a rear-engined, air-cooled vehicle) and it carries lithographed gold and black, crossed firemen's axes. 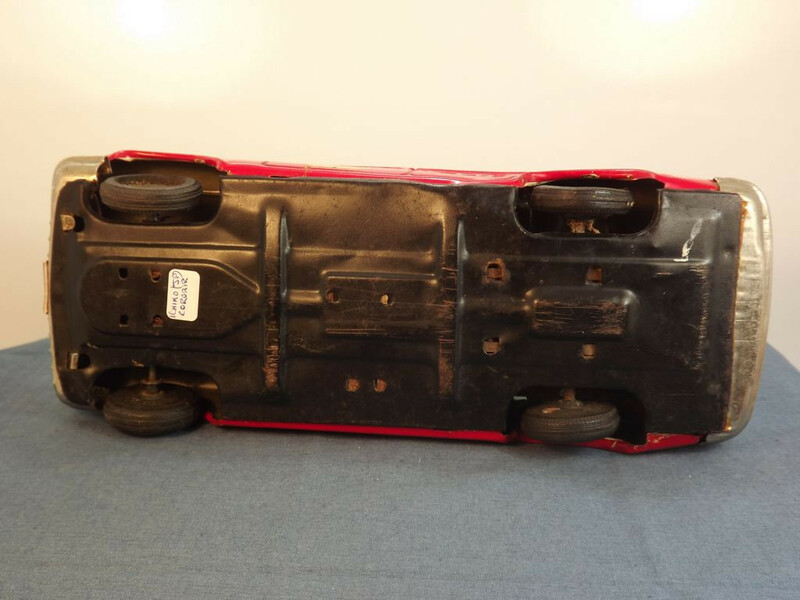 Below the "boot" there is pair of twin rear light units in pressed metal, another black on white number plate [IK-0973] and a separate chromed rear bumper. The interior of the vehicle comprises a pressed metal shape representing the dashboard, front and rear seats and rear parcel shelf. All detail is lithographed on to this pressing. A white plastic steering wheel protrudes from the "dashboard" and the mechanism for the roof lights passes up through the front seats. 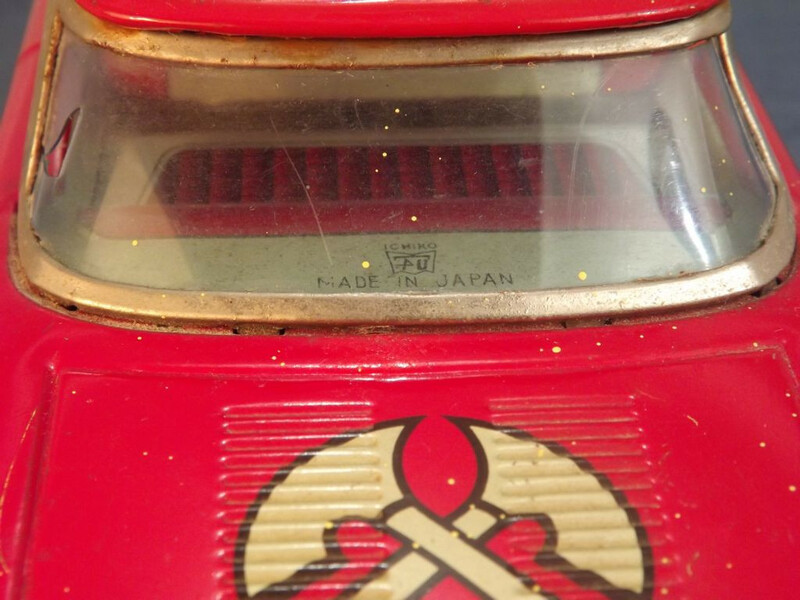 On the rear parcel shelf is printed "Ichiko [Japanese Symbols] Made in Japan". The front and rear glazing is blue tinted plastic. All of the original four rubber wheels are present. Only one front wheel hub cap remains. The rear black rubber wheels are attached to a steel axle that runs through the friction drive motor. The friction drive mechanism still works and still powers the roof lights. The base plate is a single piece, shaped, pressed tin unit. It has been press fitted to the body and is held in place by 14 folded tin tabs. It is painted black. There are no manufacturer's marks or country of origin details on the base. 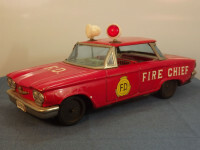 I do not know exactly when this item was issued but believe it to be between the 1960s and 1970s (the real Corvair was produced between 1959 and 1969).